It’s the only possible solution to the problem. Wait a minute. I messed that up, didn’t I? I forgot to even ask the question. Insert monkey emoji here. You know, the one where the monkey sees no evil so it’s covering its eyes. Yeah, that one. I would totally send you that right about now. But, we aren’t texting, so, let’s settle on saying: Ooops. Ohhh, or, even better, palm to the face. Or, palm to my face to be more exact. Sorry guys, I’m off my game day today. And, being all rambley, which apparently isn’t a word, but it should be, but… okay, I’ll stop now. Iwilljustshutmyselfupwithadonutorseven. You didn’t catch that, right? Perfect. Annnnnyways, let’s try this again. How do we survive the mid-week blues? Come on, I know you know the answer. Donuts you say? Why, yes, you are correct? It’s almost as if you read my mind. I have the smartest internet friends. Why donuts? Better question, why not donuts? Donuts equal happiness. It’s that simple. I mean, can you actually name a person who doesn’t like donuts? Probably not. And, even if you can, I guarantee if they ate the right donut, the perfectttt donut, they would love it.Because, I repeat, donuts = happy. And, honestly I’m at a loss as to why they don’t teach us that formula in math. It seems like a no-brainer to me. Right? 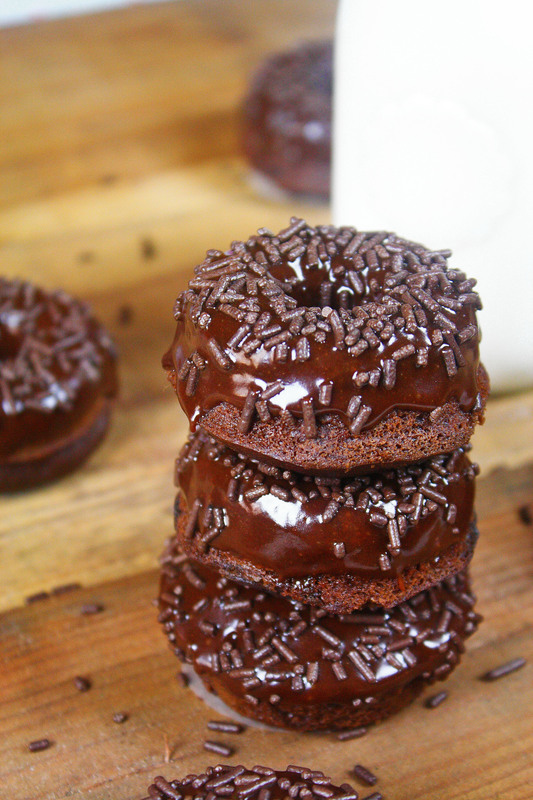 So, Mini Chocolate Fudge Donuts. 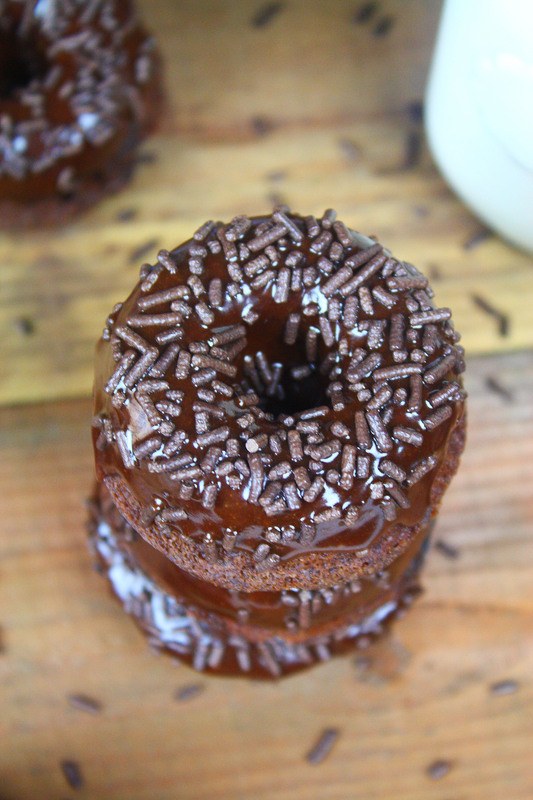 I love days that start with chocolate cake, I mean, donuts for breakfast. What? Come on. You know we can’t only occasionally shouldn’t eat cake for breakfast. It’s just not a thing people do. Well, most people. And, I get it, I do, but sometimes Wednesday’s call for extra sweetness. 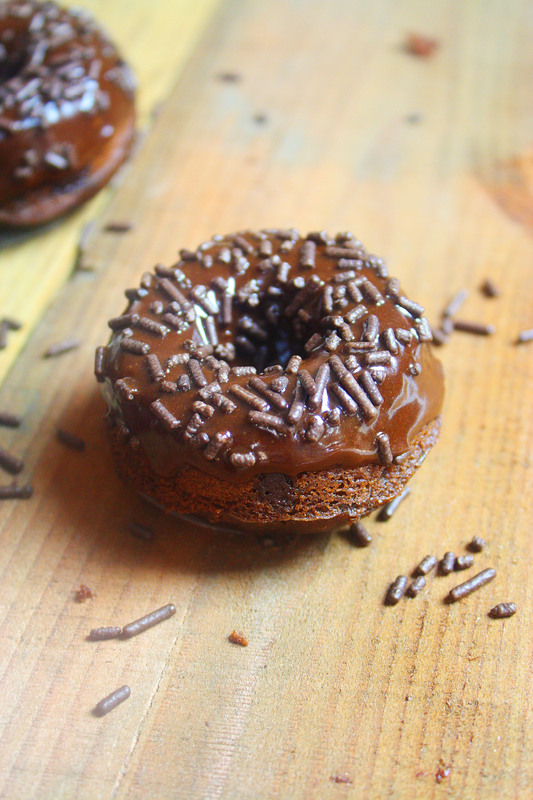 So, yes, these donuts taste like a chocolate cake lovers dream, but they are one hundred percent donuts. I repeat, donuts. Moist, cakey, soft chocolate donuts with milk chocolate chips dipped in hot fudge sauce and covered with an excessive amount of chocolate sprinkles. Seee, totalllly a donut. A decadent one, but still, a donut. And, since it’s a donut, it’s totally acceptable to eat five for breakfast, which isn’t as much as you think considering they are bite size. Preheat oven to 375 degrees and grease mini donut pan. Set aside. In a large bowl, whisk together flour, sugar, cocoa powder, baking soda, and chocolate chips. In a separate, smaller bowl, whisk the egg, vanilla, milk, vegetable oil, and sour cream until just combined. Using a spatula, stir the wet ingredients into dry ingredients until incorporated. Spoon or pipe (I found the piping method to be the easiest!) donut batter into prepared pan. Bake for 5-6 minutes or until tops spring back when touched. Let donuts cool completely. 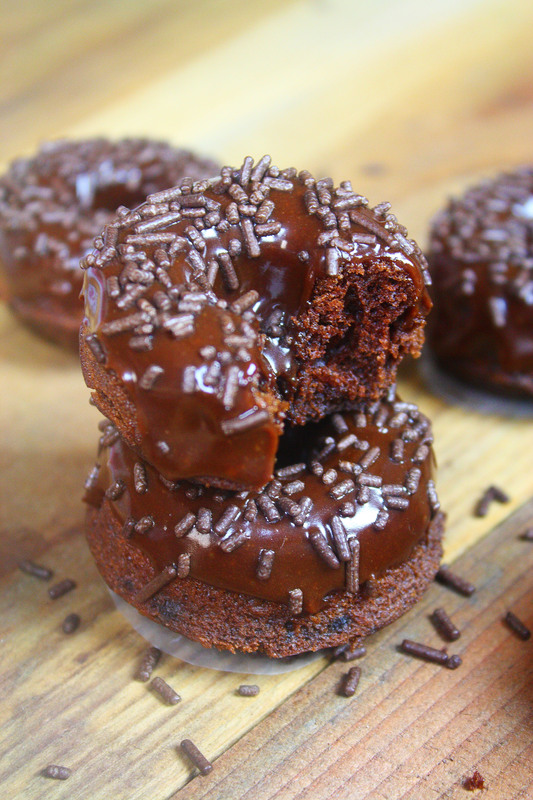 Once donuts have cooled, warm up fudge sauce for 10 seconds or until of drizzling consistency. 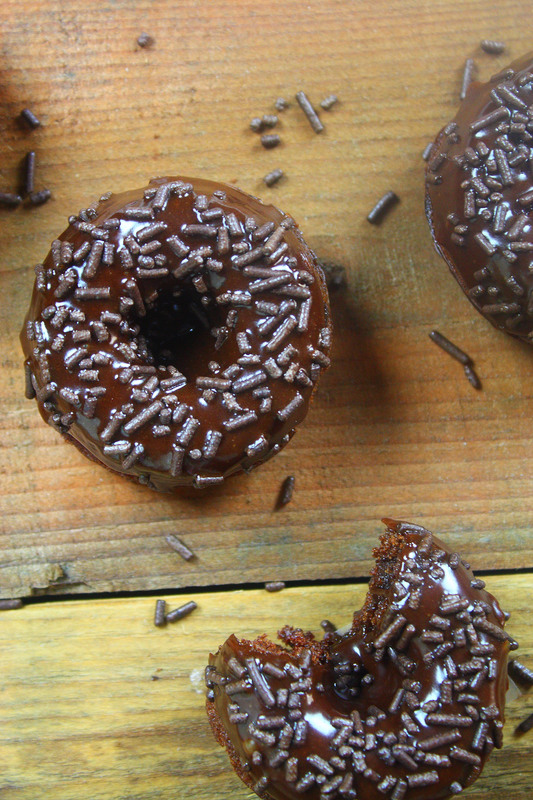 Dip the bottoms (dipping the bottoms gives you a nicer, rounder, donut top) of each donut in the fudge sauce and then sprinkle generously with chocolate sprinkles. *Store-bought or homemade fudge sauce will work. I had a batch of this fudge sauce sitting in my fridge, so that’s what I used. The only change I made to the recipe was using 6 oz of semi-sweet chocolate instead of dark or bittersweet. 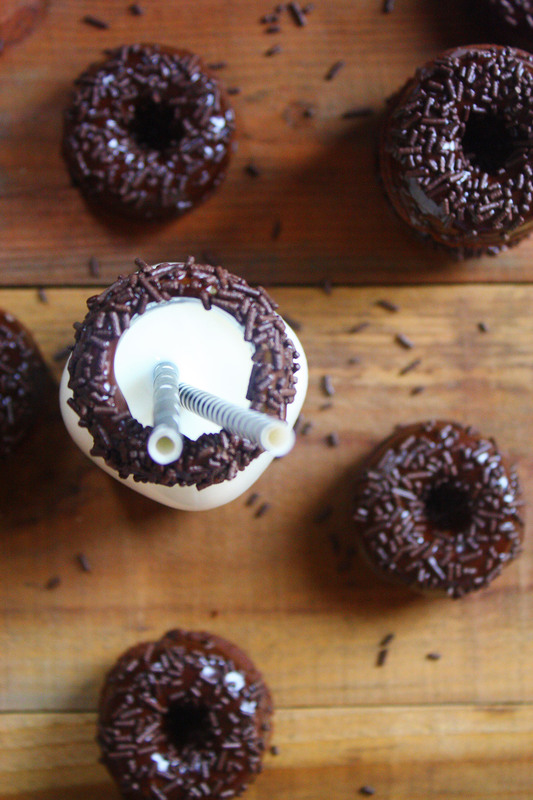 Did you notice the fudge dipped, and chocolate sprinkle covered, milk glass? Tell me you noticed that. Best. Idea. Ever.